YAY! We found a good deal using the NEW $0.50/2 Libby's Pure Pumkin coupon! 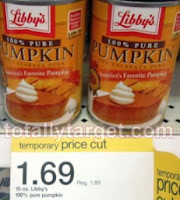 Right now at Target you can score two (2) cans of Libby's Pure Pumkin for $0.98 a piece! $0.98 a piece wyb two (2) after coupon & cartwheel!